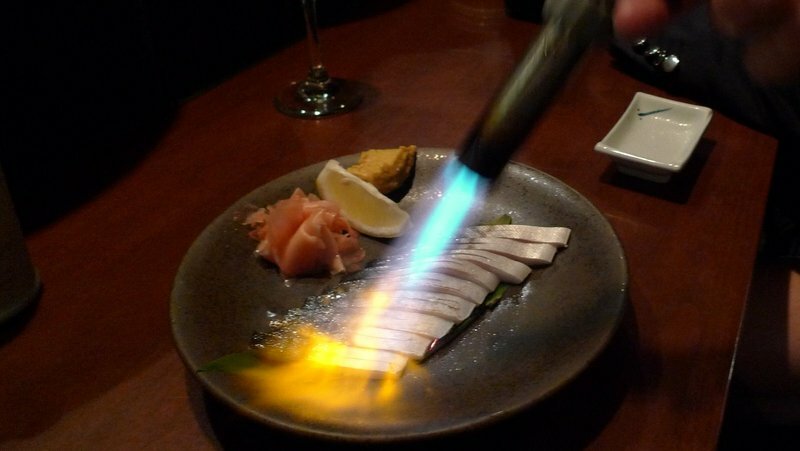 About two years ago, Gary and William took me to the Santa Monica branch of Musha, a Japanese izakaya, or small plates, restaurant. They have another branch a few miles south in Torrance and I took the opportunity during our June visit to Los Angeles to take Tawn there. It remains a satisfying place to dine. An izakaya is a drinking establishment that, in the same way that Spanish bars serve tapas, provides small plates of food to patrons to accompany their drinks, encouraging them (or, perhaps, enabling them) to drink longer. After all, you can’t continue to sell drinks to someone who has passed out and a little food in the stomach delays or prevents that happening. While at first Torrance may seem an unlikely location, the city is home to many Japanese businesses, including Toyota’s North America headquarters. As such, there are countless restaurants and other services geared towards the many Japanese who live and work in the area. 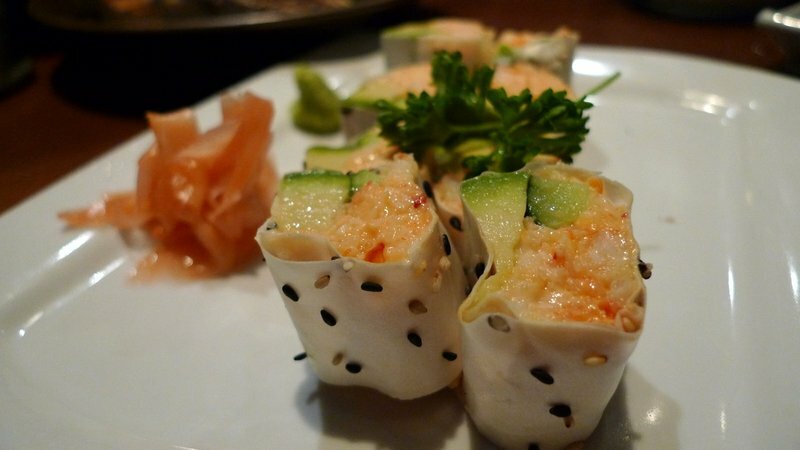 Musha is located in a strip mall on the northwest corner of Carson Street and Western Avenue. With its dark green awning, the building could just as easily house a Starbucks. The restaurant is a small space with a large table running down the center. Smaller tables line the walls and on the left is counter seating facing one of the two kitchen areas. The interior is a cozy and several fans are running to dissipate fumes from the grill-your-own dishes that are on the menu. We opted for the counter, giving us a good view of the action in the kitchen and a tempting view of plates and bowls full of some of the previously prepared foods that we could order. It took a lot of will power to not help ourselves. While I’ll avoid speculation about the holly mackerel, I will say that this is a wonderfully complex dish made of only the simplest of ingredients. The rice vinegar helps to cook the fish in a ceviche-like way. 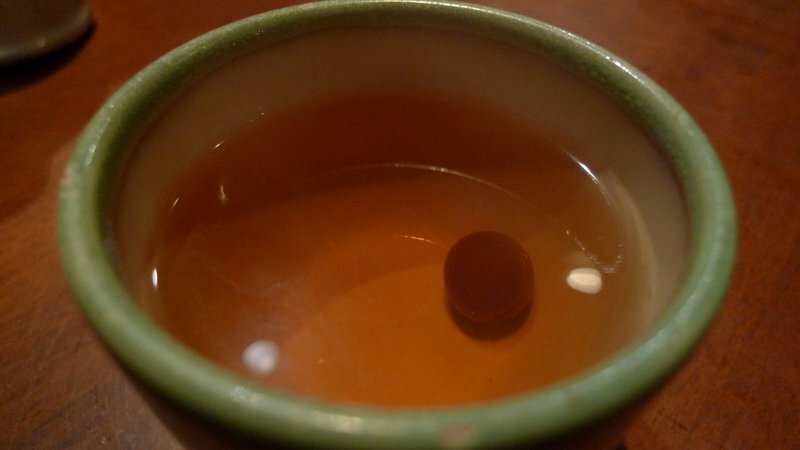 It adds a sweetness to an otherwise fishy tasting flesh. Then the torching give the skin a crispy texture with caramel flavors. To top it off, the banana leaf on which the fish is placed starts to char a bit so you get the smoky fruit aroma. While the dish is really only two ingredients – fish and vinegar – the flavor is multi-layered and complex. The second dish was the lobster roll, a riceless bit of sushi that uses a thin springroll wrapper instead of seaweed filled with lobster and cucumber. Very tasty. 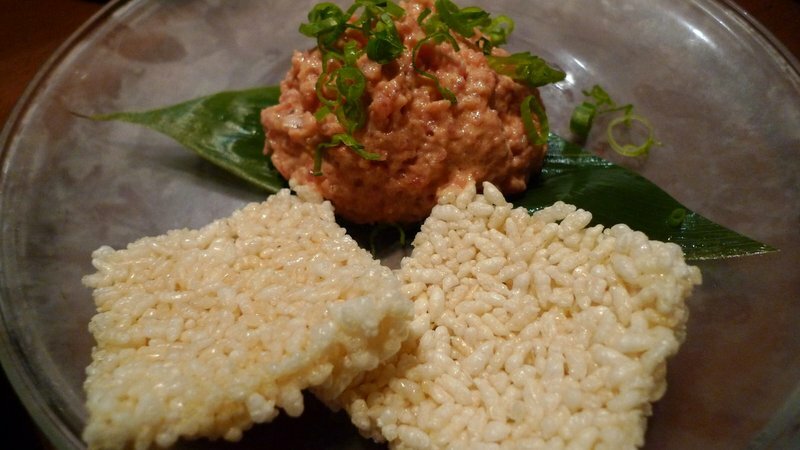 One of my favorite dishes is the spicy tuna dip served with rice crackers. The name pretty much describes what it is, but doesn’t have any superlatives that convey how tasty this dip is. Might I suggest something like, One of the Tastiest Things You Will Ever Scoop with a Cracker? 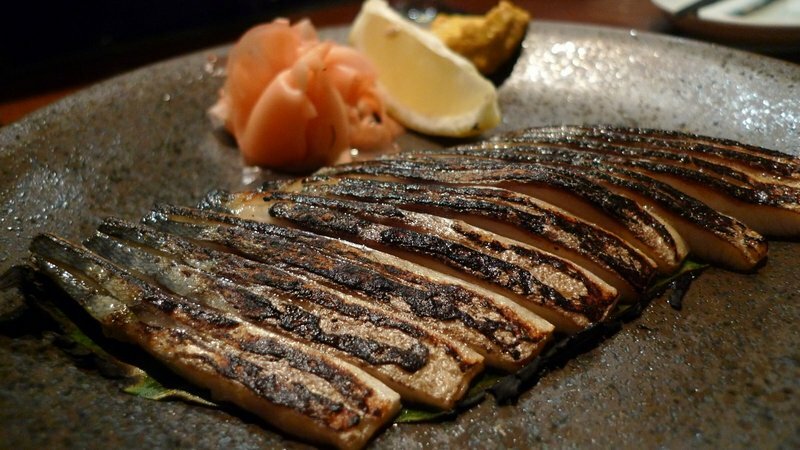 Another Musha signature dish is the Takotama. 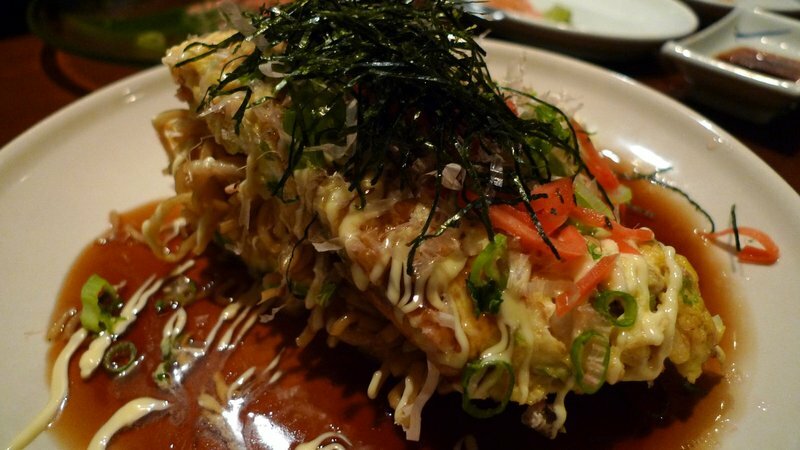 This is their take on okonomiyaki, a “Japanese style pancake”. 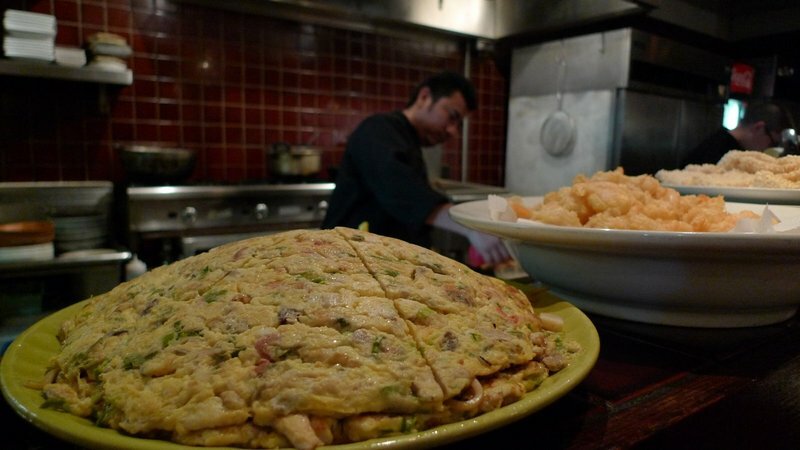 In the case of Takotama, you have the two-layered omelette (pictured sitting on the counter above) with chopped octopus, Tokyo leek, red ginger, bonito flakes, chives, and nori seaweed. The sauce is a thick, sweet sauce topped with mayonnaise. 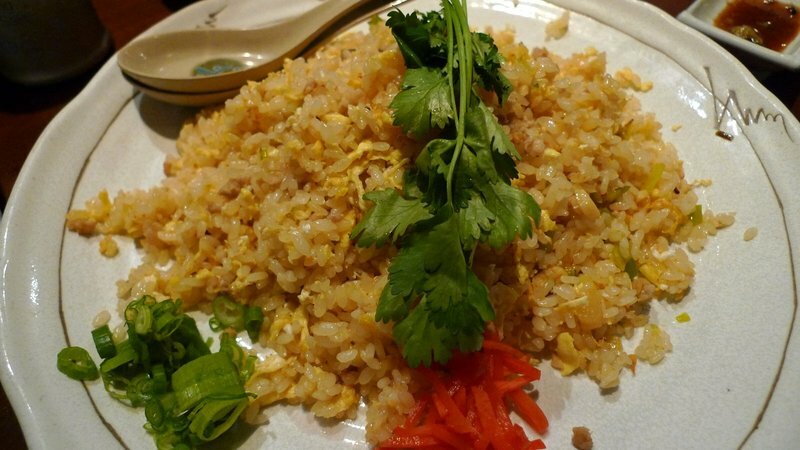 To finish we had a plate of Typhoon Char Han, a spicy fried rice prepared with ground pork, chili, bamboo shoot, ginger, garlic, and Tokyo leek. Tasty and filling. Stuffed and running out of time to head to LAX and pick up my sister and her family, we skipped dessert, cleansing out palettes with the complimentary salted plum tea. All in all, I think Musha offers tasty food at a fair price. Like all “small plates” restaurants, you have to watch out because the bill can rapidly increase. That isn’t a matter of the prices being high; instead, it is a matter of ordering more food than you really need. If you are in the South Bay part of Los Angeles, or in Santa Monica, a stop at Musha would be worth your while. This entry was posted in Uncategorized and tagged California, Dining, food, Izakaya, Japanese, Los Angeles, Musha, Restaurant, Torrance by christao408. Bookmark the permalink. 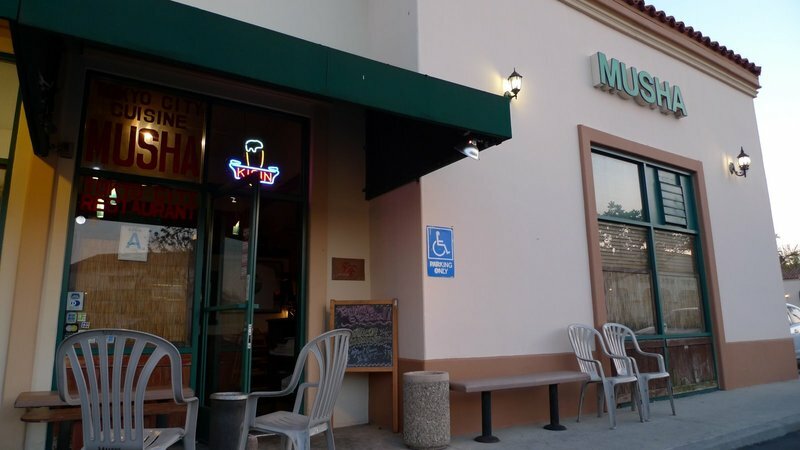 my godchildren live in lomita, will definitely swing by musha the next time i go to visit! Another great adventure by those two guys that travel the world eating all the time. But remain always in tiptop shape. last 2 weeks while I was in HKG at a JPN restaurant, once the sashimi dish arrived, all of a sudden I felt sick just looking at it and could not even have one piece of it, last week-end in Vancouver, same thing happened again…what a pity!I guess a lot of chefs prepare the Creme Brulee just like the Mackerel dish above, no?anyway thanks for the sharing of any place for good food! I will put that in my places to visit if I get to the coast. Not fair to post this so early in the morning… Now I’m going to be hungry all through church (hehe) The photos were food magazine good! 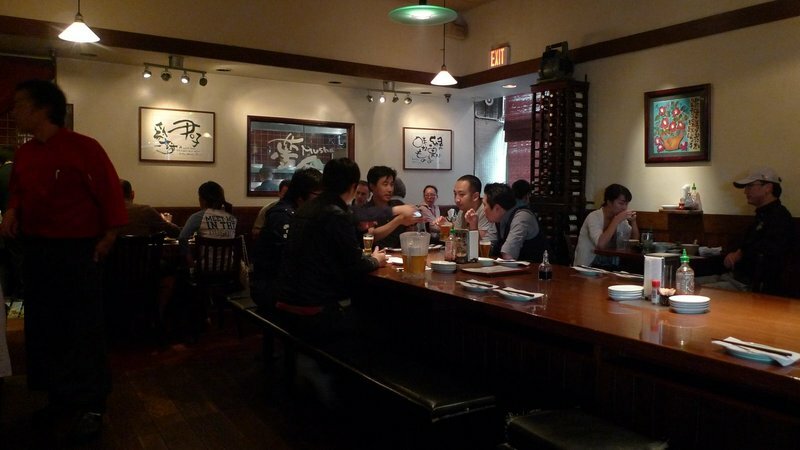 I like the communal table down the middle – especially with those guys enjoying beer and conversation. There’s a couple of izakaya style restaurants here that I want to try but the long line ups (no reservations) are a turnoff. @ElusiveWords – No reservations can definitely make a restaurant less appealing, although I think that Musha may also be a restaurant that does not accept reservations. The idea of a communal table is lots of fun, agreed. @murisopsis – Isn’t being hungry all through church a good thing? Reminds you of how Christ suffered for our sins or something like that. Not sure that hunger pangs are quite the same but, oh well…@Fatcat723 – Please do. Between my blog and Gary’s, your list of to-visit places should be quite long! @agmhkg – Interesting, I wonder why you had that reaction? I think I’ve had similar feelings at time, too. Yes, the preparation method for the mackerel is pretty much just like making creme brulee. @The_Eyes_Of_A_Painter – Oy! Definitely not tip-top shape, at least in my case! LOL@clubsmiley – @M_1 – Oh, you really should try. Would be interested in hearing your thoughts. @alwateen – If it is unhealthy to eat something that has just been cooked using a butane torch, then we’ve got a whole lot of people in this world (nearly everyone eating creme brulee!) who are in trouble… =(@slmret – Yes, it really is quite nice. @CurryPuffy – Even though their portion size seems to have shrunk a bit, I still think that dish is one that remains on my “wonderful things to eat” list.